Places of worship like churches, synagogues, temples, and mosques, often contain artwork of incredible artistic, religious, and historic value. Wiebold Studio serves schools, universities, libraries, and museums, preserving statues, murals, paintings and stained glass. 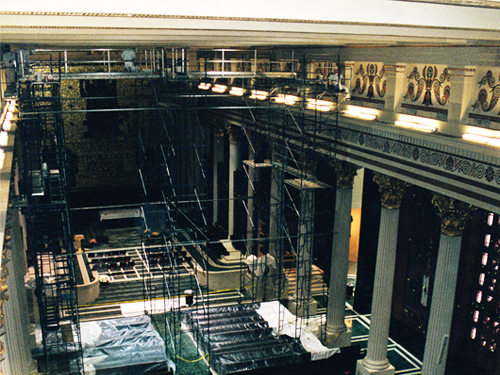 The Wiebold team's depth of experience and broad background enables us to carry out virtually any restoration or repair project, either onsite or in our studio. At Wiebold Studio, we consider it a privilege to lend our expertise to these projects, ensuring that future generations enjoy these incredible spaces. Elaborately painted murals in this downtown-Cincinnati landmark are a highlight of this beautiful Gothic Revival-style cathedral opened in 1861. Years of environmental effects, like candle smoke, had taken a toll on its vibrant paintings—the varnish had yellowed and the colors had shifted. Wiebold Studio's expert conservators thoroughly cleaned the elaborate paintings, removed yellowed varnish, repaired portions of the mural, and reapplied gold leaf to the Saints' halos. The murals were then re-varnished to protect them into the future. Floor-to-ceiling murals are among the many decorative features inside the Cathedral of St. Peter in Chains—a Greek Revival cathedral. A small fire in the early 1990s left behind a layer of smoke and soot on the Cathedral's magnificent artwork. Wiebold Studio delicately cleaned the floor-to-ceiling, gold-and brown-toned murals and restored the cathedral walls to their vibrant colors. As one of only 66 minor basilicas in the U.S., the Cathedral Basilica of the Assumption in Covington, Kentucky is a tourist destination as well as a community venue for concerts and worship. 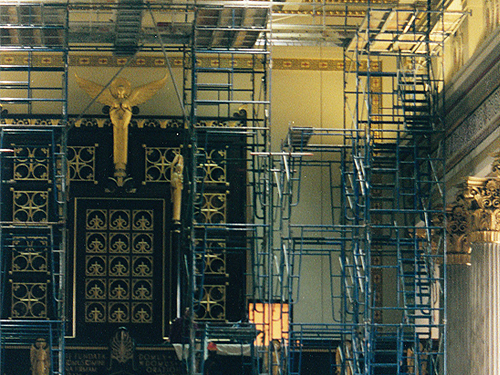 During a major renovation, Wiebold Studio was asked to restore metal work in the Basilica. 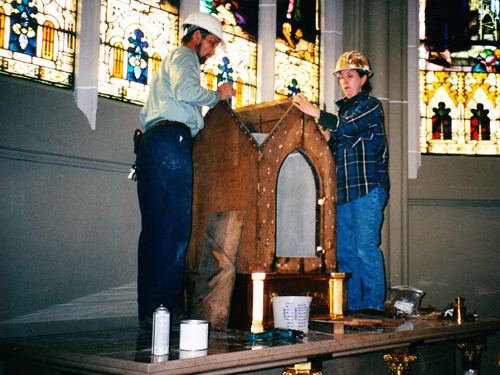 Our skilled metalsmiths repaired and restored brass paneling, ornate metal work around the altar, communion rail and tabernacle, and refreshed the gold leaf adornments on the support columns. A gift in 1914 from entrepreneur and inventor Edward Lee McClain, this Georgian Revival-style high school contains a vast collection of paintings, murals and statues. Years of everyday wear and tear, as well as neglect, caused the building to be slated for demolition. But the community rallied to save the building and raised the funds for renovation and restoration of the art collection. The building houses dozens of large plaster statues made to look like marble. Replicas of the world's greatest statues, like Venus de Milo and Aphrodite, as well as busts of American leaders like George Washington were severely distressed. The Wiebold team made significant repairs to the statues and preserved them for future generations. The project received numerous awards, including the National Trust for Historic Preservation's Historic Neighborhood School Honor Award. The School's collection draws visitors from across the country. A statue of Mary graces the entrance to Mother of Mercy High School. But the life-sized statue on a pedestal had significant weathering and damage to her fingers, thumbs, and toes. Wiebold Studio's conservators worked onsite to repair the statue's damaged hands, feet, and base. Our team also pressure-cleaned the statue (and a courtyard bench near the statue), filled joints, and sealed the entire statue.